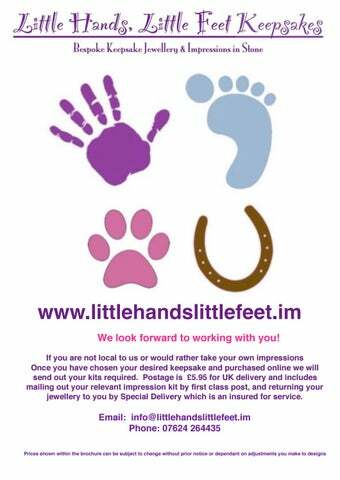 www.littlehandslittlefeet.im We look forward to working with you! If you are not local to us or would rather take your own impressions Once you have chosen your desired keepsake and purchased online we will send out your kits required. Postage is £5.95 for UK delivery and includes mailing out your relevant impression kit by first class post, and returning your jewellery to you by Special Delivery which is an insured for service. 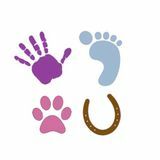 Stone Impressions Artwork, from your impressions We are also specialist life casting artists working with stone, creating a raised impression of your or your childrenâ&#x20AC;&#x2122;s hands and feet......also not forgetting our furry friends paws and horses hooves! With stone impressions we are unable to do this with kits and we need to personally take impressions for you in store. All stone impressions are set in a frame that is specifically custom made by hand just for your keepsake. You choose your design - the wood, mount board, stone impression colour scheme, details can be added such as name/age with a nameplate / handwritten details or created in wood or other designs. Purchase online to have your kit posted to take impressions and your jewellery once completed is sent back to you via Special Delivery or equivalent tracked and signed for worldwide delivery. If you are local and would like a design consult along with impressions being taken, you can select this option at checkout or simply book an appointment and you will be required to pop back to collect your jewellery once it is ready for you. Impression Styles For Our Jewellery Our jewellery can be created using yours and your families actual impressions. Impressions such as handprints/footprints and also drawings/doodles are miniaturised from impressions to allow us to create in to your chosen jewellery. You may already have hand/footprint impressions that have been taken on paper, we would just need a copy to create from these…..Or we have kits that are mess free allowing you to take impressions mess free and easily and return them to us…..We also are available weekly to take impressions for you in store (Isle of Man) at an appointment, if you are local to our studio. Dainty Sterling Silver Dainty Clusters Baby/Child/Adult/Pet Prints Simply choose your size’s some like them all the same size and other like to stagger up in size,the choice is yours - We make them slightly thinner in thickness to allow them to hang beautifully together as a cluster or on individual jump rings and it’s not as heavy as our regular chunky range. Beautiful Designs From your families actual impressions!